I was a little nervous about this recipe before starting it. The applesauce bread I made last weekend was pretty tasty, but also a little strong. And, there was no icing listed in the recipe to go on the cupcakes. At first I did some research and found that other people have made this recipe and then added a caramel icing/glaze on top. But, I also read that the cupcakes were delicious without anything on them, so I decided to give that a shot. I realize they don’t look like much, but they were actually really good. There’s a lot of sugar, and it sort of crystallized on the outside, giving them something almost like a shell. The batter looks awkward while you’re making it – before you add the applesauce, it looks more like a really thick cookie dough. But it will all work out, I promise. 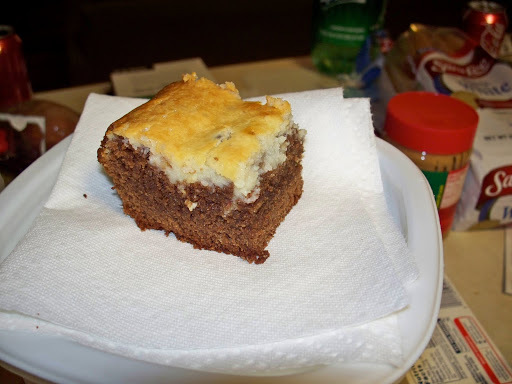 Before I add the recipe, here is one more from the Iron Chef Blogger Challenge: Cream Cheese. Carrie made an Artichoke Bread, and it looks delicious! So, here it is. It’s originally from the Lady and Sons Savannah Country Cookbook. I left out the cloves (because I apparently didn’t have any and don’t like them that much anyway) and the raisins (because I think they’re gross). Preheat oven to 350. Mix above ingredients in a bowl by hand, except for applesauce. Last, add hot applesauce and baking soda. Pour batter into paper-lined cupcake pans. Bake for 25 minutes or until done. Yields about 2 dozen cupcakes. This entry was posted in Uncategorized on January 31, 2010 by michelejames. Iron Chef Blogger Challenge: Cream Cheese! My first indication that all was not well was that I somehow managed to crack an egg inside the egg carton. I wish I’d taken a picture, it was actually sort of amazing. Looked like I was trying to separate it. The second problem was that the recipe started on one page in my cookbook, then finished on the back of another page. So I wasn’t paying quite as close attention as I should. When I finished the brownie dough, I thought it looked oddly thick. I flipped back, only to discover that I had put an entire extra cup of flour into the batter. I tried adding some more water to thin it out a bit, that was probably a bad move. Finally, instead of layering my brownie mixture with cream cheese mixture, I accidentally put all the brownie mixture in the pan first, then had to just dump the cream mixture on top of it. I don’t know which part of this catastrophe led to the poor cooking, but something caused my brownies to still be partly liquid after their 25-30 minute cooking time. I ended up cooking them for 20 or 25 more minutes to try to get them cooked in the middle. This resulted in a brownie that is very overcooked on the bottom and a bit too gooey towards the top, as you can see below. It is mostly edible, but a bit funny tasting. I will definitely not be taking these to work tomorrow. However, I will post the recipe anyway, since if they were made properly, I think they’d be quite delicious. There also 2 new Iron Chef Challenge (1 nutmeg, 1 bacon/mushrooms) that I forgot to link to last time: Banana Bread with Chocolate Chips and Walnuts and Stuffed Mushrooms/BLTs. 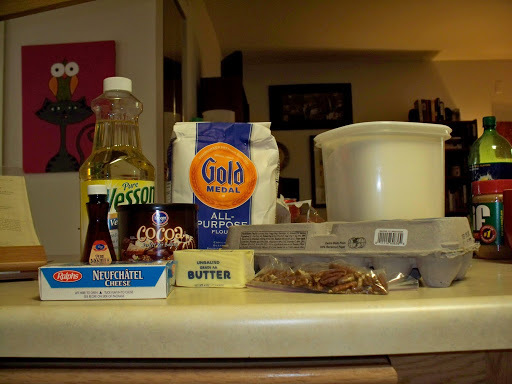 For brownie mixture: blend together sugar, oil, eggs, cocoa, and vanilla. add flour; mix. add nuts. For cream cheese mixture: Cream together butter and cream cheese. Add remaining ingredients; blend well. Pour 1/2 brownie batter into greased pan. Layer with this cream cheese mix then top with remaining batter. Swirl into brownie batter with knife edge. Bake 25-30 minutes. This entry was posted in Uncategorized on January 25, 2010 by michelejames. 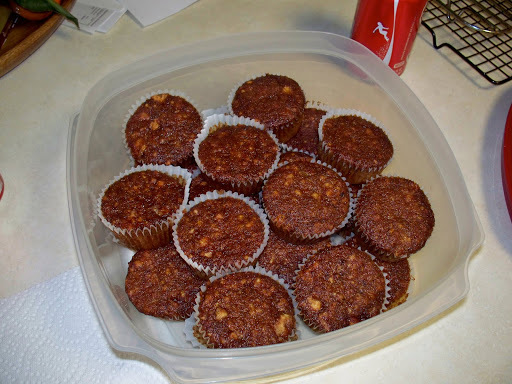 Iron Chef Blogger Challenge: Nutmeg! I was a little bit at a loss for what to do when the secret ingredient this week was nutmeg. The only thing that really jumped to mind was eggnog, then pumpkin pie. 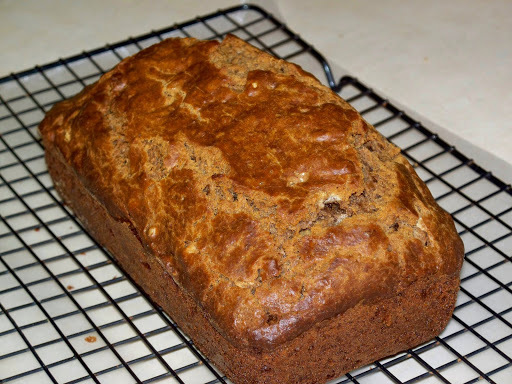 So, I flipped through my cookbook and came across this recipe for Applesauce Bread. The only problem is that when I make bread it ALWAYS burns on the top. I mean always. So, I did a little bit of research to try to get some tips. However, apparently no one else in the world has ever burned the top of bread, everyone else burns the bottom. Whatever, I found a suggestion to turn the oven temperature down 25 degrees, and it worked. The bread is okay, it’s really dark and probably could have used a bit more sugar (or maybe a bit less nutmeg? – the spices are really strong). I don’t totally love it, but I will probably eat it for breakfast this week. Preheat oven to 350 degrees. Combine all ingredients except nuts. Mix well until blended. Stir in raisins and nuts. Pour into greased and floured 8 x 4 x 3 inch loaf pan. Bake for 60 to 65 minutes. This entry was posted in Uncategorized on January 23, 2010 by michelejames. This is not food related, just something I thought was interesting. I planted marigolds last year. 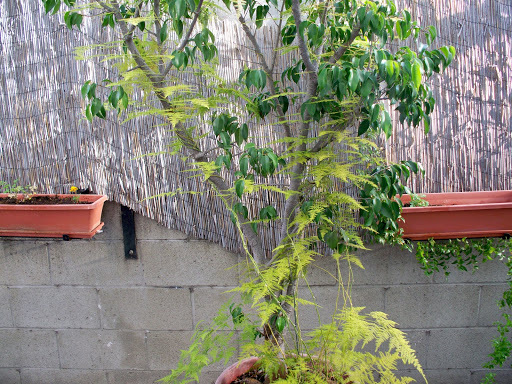 I planted them in the planter to the right (see picture below). Last month, a marigold came up (and is now blooming) in the planter to the left. Amazing! This entry was posted in Uncategorized on January 16, 2010 by michelejames. 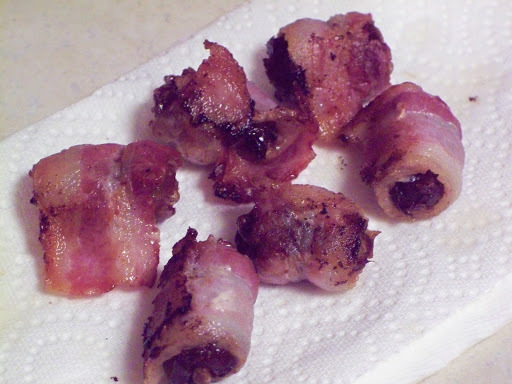 Iron Chef Blogger Challenge: Bacon! I am eating the most delicious thing right now. It’s a Bacon Wrapped Date. You can see the photo, right up there. To be fair, the Lady and Sons Savannah Country Cookbook called it a Pecan Stuffed Date. Both are accurate, ingredient wise. However, I think the latter doesn’t call enough attention to the fact that it is WRAPPED IN FREAKING BACON! As you can probably tell, I really like bacon. I try not to eat a crazy amount of it, for health reasons, but man it’s yummy. So, I was super pleased to find out this week that the secret ingredient for the Iron Chef Blogger Challenge was bacon. I always sort of assumed that I didn’t like dates. Pecan Stuffed Dates is the 1st recipe in the Lady and Sons Savannah Country Cookbook. I always just skimmed over it, thinking that it looked weird. I’ve been cooking out of this book for years, flipping through it quite often, and I only noticed a couple of months ago that the dates were also wrapped in bacon. Still.. dates.. I was unconvinced. 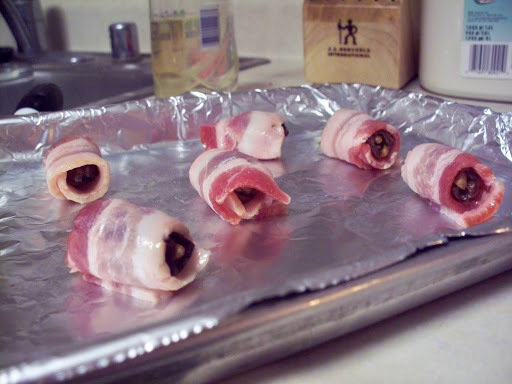 Then, at a holiday party this year, bacon wrapped dates were served, and I was instantly won over. The dates are sweet and a little chewy.. the bacon wrapped around it is salty and crispy, which is a lovely textural difference. And the pecan in the middle gets toasted and crunchy. All in all, it’s a really delightful recipe – I highly recommend it. You just get an 8 ounce bag of pitted dates (they’re by the raisins. I learned this the hard way in Ralph’s today), pecan halves, and bacon. The recipe says it yields 30, so I assume that is how many are in the bag. You’ll need that many pecan halves (possibly less actually) and 10 slices of bacon. Stuff a pecan half in each date. Sometimes I couldn’t manage to fit a pecan half into each one, so I broke them into quarters. Cut a piece of bacon into 3 sections, wrap each section around 1 date. Secure it with a toothpick (I didn’t do this, but I’d recommend it to help move them later). Bake it at 400 for 12-15 minutes. You should probably turn them part way through so the bacon can brown on both sides. Below is a picture of the little guys wrapped up, ready to go in the oven. It’s so easy I decided to only cook what I wanted to eat right now. The rest I’ll make later this week. That was probably a wise decision, as I’m pretty sure I could eat several more right now if they were available. There’s been one more bacon recipe so far, and it looks amazing. Carrie made Spinach Bacon Potato Mille Feuille. Just click over and look at the picture, you’ll want to try it even if it has an intimidating name. For the Iron Chef Blogger Challenge this week, our secret ingredient is brie! I have to admit, brie isn’t exactly my favorite cheese. 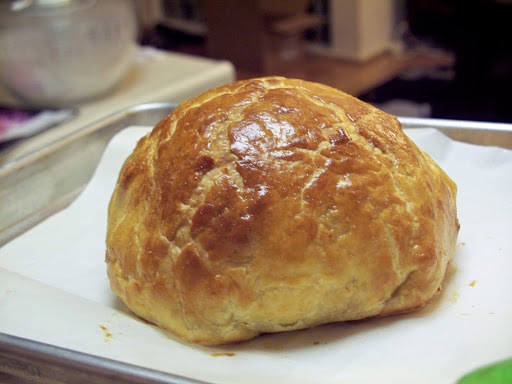 But, I decided to make a variation of Brie en Croute, a recipe I made once before with Sarah, and that she has previously blogged about as well. The first variety I made had raspberry jam in it. I thought I would like this one better, with walnuts, brown sugar, and cinnamon topping. But, it was a bit too sweet. I think that reducing the amount of topping the recipe calls for would certainly help. This is what Brie en Croute looks like fresh from the oven! 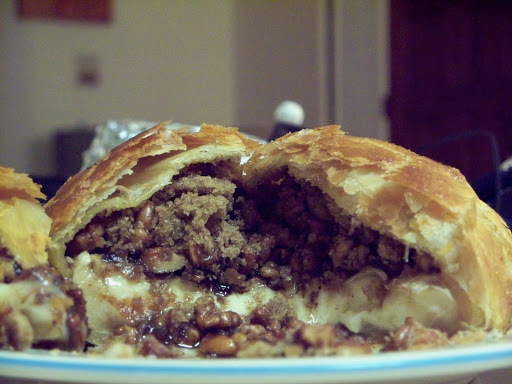 I love things wrapped in pastry. And here is the gooey delicious (if a bit too sweet) interior. All in all, the recipe is really simple. The process of getting the brie into the pastry sounds complicated, but it really wasn’t. I didn’t even tear the puff pastry! Preheat oven to 375. Defrost puff pastry for approximately 15-20 minutes and unfold. Melt butter in a saucepan over medium heat. Saute walnuts in butter until golden brown, approximately 5 minutes. Stir in cinnamon, coating nuts well. Place mixture on top of wheel of Brie. Sprinkle brown sugar over the mixture. Carefully place pastry sheet over wheel of Brie (make sure it is centered). Gently pick Brie up with pastry hanging over the edge and fold the pastry under the Brie. Trim excess pastry with scissors so Brie lies flat and seal all the edges to prevent leakage. Brush beaten egg over top and sides. Place on an ungreased cookie sheet and bake for 20 minutes until pastry is golden brown. Serve with top-quality crackers. This entry was posted in Uncategorized on January 10, 2010 by michelejames. The actual name of this recipe in the Lady and Sons Savannah Country Cookbook is Oysters in the Patty Shell. 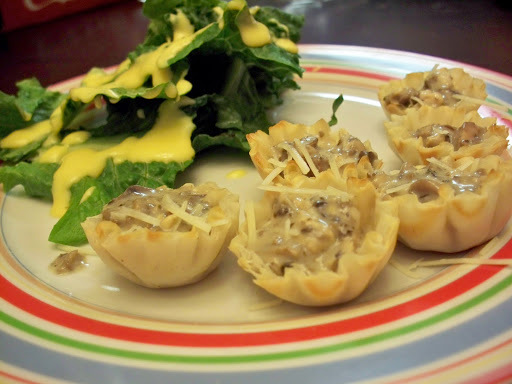 However, I frankly have no idea what a patty shell is; so henceforward I will call it Oyster and Mushroom Cups. They are so delicious! I used fresh oysters in a jar that the seafood department at Ralph’s had in stock. They were from California, so I felt pretty confident in their freshness. They were a vast improvement over my attempt at using canned oysters. I definitely recommend this recipe. Between the mushrooms and the oysters, it has this great earthy flavor. I have a tip as well. I would not try to chop oysters in a food processor. It’s all fun and games until you end up with oyster paste. Since I don’t know what patty shells are, I used some pre-baked phyllo dough cups that were on sale at Ralph’s for $1 a pack. Since the recipe calls for a 3-inch shell, I needed a lot more cups than the 8 that the recipe suggests. On the side is just some lettuce with a honey mustard dressing that I made earlier that day. The dressing is okay, but not spectacular. Saute mushrooms in butter until tender. Blend in flour and cook until bubbly. Gradually add milk; cook until smooth and thickened, stirring constantly. Add salt, celery salt, pepper, lemon juice, and oysters. Cook over medium-low heat until oysters start to curl up (about 5 minutes), stirring constantly. Serve in mini piecrusts or patty shells. If desired, garnish with parsley. This entry was posted in Uncategorized on January 3, 2010 by michelejames.